Purpose: Use this document as a reference for running the automated accounting process in ctcLink. 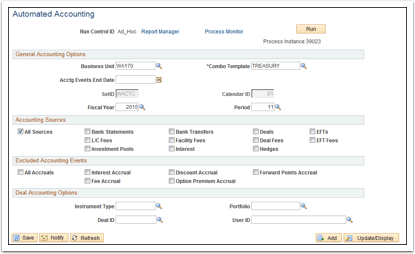 The Automated Accounting Process creates accounting entries and prepares them for the Journal Generator process. 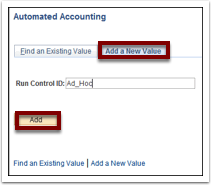 Enter an existing Run Control ID or click the Add a New Value tab on the Automated Accounting page to add a new value. Enter a meaningful Run Control ID for the automated accounting process in the Run Control ID field. If it doesn’t default, enter or select the business unit in the Business Unit field. 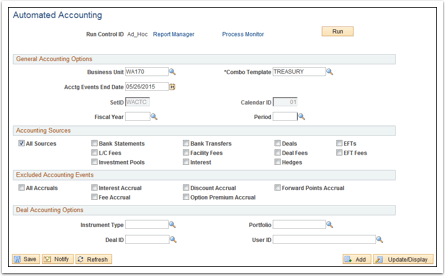 You can also leave the Business Unit field blank to set up automated accounting for multiple business units. Note: If you enter a business unit defined with a calendar ID, the calendar ID appears on the page. Note: If your business unit has an associated calendar, enter fiscal period details instead of the accounting events end date. Depending on your business unit requirements, enter either a date in the Acctg Events End Date field or enter a fiscal year and period in the Fiscal Year and Period fields. Note: The process creates accounting entries even if errors occur. Use the Accounting Entries page to correct any errors, and then change the status from ‘Error’ to ‘Provisional.’ Use the View/Approve Entries page to change the status from ‘Provisional’ to ‘Final.’ The accounting entries are then ready for General Ledger. You do not have to rerun the Automated Accounting process. Note: A Process Instance number appears. This number helps you identify the process you have run when you check its status. Verify the expected results were received.